Password Safe allows you to easily and securely manage your passwords. Instead of using a single password for all your accounts, you can have a different password for each site, yet only have to remember a single master password. How many passwords and user names do you have to keep track of? Whether the answer is one or hundreds, Password Safe allows you to safely and easily create a secured and encrypted user name/password list. With Password Safe all you have to do is create and remember a single "Master Password" of your choice in order to unlock and access your entire user name/password list. Security starts with you, the user. Keeping written lists of passwords on scraps of paper, or in a text document on your desktop is unsafe and is easily viewed by prying eyes (both cyber-based and human). Using the same password over and over again across a wide spectrum of systems and web sites creates the nightmare scenario where once someone has figured out one password, they have figured out all your passwords and now have access to every part of your life (system, e-mail, retail, financial, work). Password Safe allows you to manage your old passwords and to easily and quickly generate, store, organize, retrieve, and use complex new passwords, using password policies that you control. Once stored, your user names and passwords are just a few clicks away. Using Password Safe you can organize your passwords using your own customizable references?for example, by user ID, category, web site, or location. You can choose to store all your passwords in a single encrypted master password list (an encrypted password database), or use multiple databases to further organize your passwords (work and home, for example). And with its intuitive interface you will be up and running in minutes. Oh, and the desktop version of Password Safe is freely available under an Open Source approved license. disk-on-key versions are also available. For customization and commercial support, please contact me. Exquipass is a password manager and keeper software which is the fastest and most affordable way to organize all your IDs, Passwords and secret notes. It also secures your private information from being stolen by spywares and hackers. 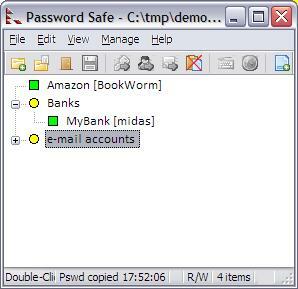 PWMinder is a Password Manager that is used to store passwords and other sensitive data in a secure encrypted file. Includes a configurable Password Generator, and ability to automatically log in to web sites. Pdf restrictions remover software, enable pdf printing, permit pdf editing, allow text and graphics copying, form filling, signing & commenting. Unlock pdf open & owner password either protected with 40 bit or 128 bit RC4 & AES protection level. Password Manager stores all your important passwords. Try Pdf security restrictions remover software and make pdf 100% editable, printable, copyable. Convert locked pdf into decrypted format to enable all rights for form filling, signing and commenting. Remove open password & owner prevention instantly. Get VBA password back by one and only VBA Password Remover software. VBA Password Remover Software easily retrieves and gets back VBA Password in few minutes. Asterisk Key is a free tool for uncovering passwords for e-mail accounts, web sites, network connections and other types of passwords that are hidden behind asterisks. Sometimes you forgot your VBA project password and now if you want to recover your lost VBA password. Try VBA Password Remover software easily recover reset or replacing the password which never fails while scanning your data. VBA Password Cracker Software easily and quickly solve How to Retrieve VBA Password problem and Unlock VBA Files in just few clicks of mouse. VBA Password Remover Software is the easily and simple application to recover lost VBA Project Password. Password Memory helps you organize and secure your passwords. Your passwords are encrypted using multiple algorithms to keep them secure. Generate random secure passwords with the click of a button. Available in several different languages. Sticky Password FREE is the password manager with everything you need for secure passwords and online form filling. You'll have safe passwords and automatic login and one-click form filling. The portable version is included free. LockCrypt Mobile J2ME provides a secure, password protected database of your accounts. It uses an encrypted database, enabling you to access your account information, bank details, passwords or other information from a phone or PDA. This site does not contain serial number, crack, keygen PasswordSafe serial number : serial number is the simplest type of crack. A serial number(cdkey,product key,etc) is register the program as you may already know. a crack or keygen may contain harmful software. If you cannot find the exact version you want, just give it a try. for more information read .nfo/.txt/.diz file include in zipped file.